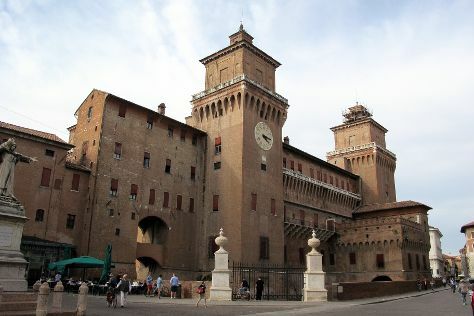 Start off your visit on the 8th (Sat): get to know the fascinating history of Le Mura, take in the exciting artwork at Palazzo dei Diamanti, take in the spiritual surroundings of Monastero di Sant'Antonio in Polesine, then steep yourself in history at Palazzo Schifanoia (Palazzo della Gioia), then contemplate the long history of Palazzina di Marfisa d'Este, and finally get a sense of history and politics at Castello Estense. On your second day here, take an in-depth tour of Pomposa Abbey, snap pictures at Trepponti, then don't miss a visit to Centro Storico Ferrara, then pause for some serene contemplation at Ferrara Cathedral, and finally get to know the fascinating history of Via delle Volte. To see maps, photos, traveler tips, and other tourist information, use the Ferrara route planner . If you are flying in from Australia, the closest major airports are Bologna Guglielmo Marconi Airport, Verona Villafranca Airport and Venice Marco Polo Airport. Expect a daytime high around 34°C in June, and nighttime lows around 20°C. Finish up your sightseeing early on the 9th (Sun) so you can travel back home.